The biggest name in the coaching world over the past month has been Atlanta Falcons offensive coordinator Kyle Shanahan. That’s for good reason, as the 37-year-old understands the vast superiority of the play-action pass as much (or more) than any other OC in the NFL today. Over the past five years, Shanahan’s offenses have never finished outside the top-10 in play-action rate, and only finished outside the top three once. The benefits of using a run fake are well documented. Of 29 qualifying starting quarterbacks in the NFL this season, 19 saw their completion percentage rise with play action compared to no play action, while 24 saw an increase in their yards per attempt. Below are the league-wide rates with and without a run fake on first and second downs (third- and fourth-down stats would be skewed by negligible threat of run). As you can see, there’s a minuscule difference in almost every relevant statistical category except for yards per attempt and time to throw. Simply put, play action is the easiest way to scheme quarterbacks more time and create big plays downfield. In fact, play-action passes accounted for 38.3 percent of all pass plays gaining 20 or more yards on first or second down in 2016, despite accounting for only 25.6 percent of the dropbacks. The point I’m trying to make: play-action fakes are the most underutilized offensive tool in the NFL today. That is, unless you’re the Atlanta Falcons. Matt Ryan executed a run fake on 27.6 percent of his attempts this past season, the highest rate in the league by over three percentage points. And the results are as good as one would expect. Ryan’s yards per attempt off play-action ranks first among QBs this season, while his passer rating is fourth. No team generated more explosive plays downfield off of play action than the Falcons and it’s not by coincidence. Their concepts are carefully crafted to be interlaced throughout the entire fabric of the offense. At the heart of it all is the outside zone run. One of the most popular run concepts in the NFL today, outside zone accounted for 42.4 percent of the Falcons’ handoffs this season. Not only is it an effective run concept, but also play action off outside zone affords the quarterback, on average, far more time than a normal dropback when passing. The crux of this is the unblocked defender on the backside of the play. If he chases after the run, the quarterback will have all day and a free running lane. If the defender chases after the quarterback, he leaves a gaping cutback lane for the running back. When faced with that conflict, a defender is normally coached to squeeze down his gap until it’s obvious that it’s a pass, and then attack the quarterback. Even if unblocked, this still affords the quarterback 3.5 seconds or more to find an open man—an eternity in the NFL. The unblocked defender is not the only one put in a bind, though. Off-ball linebackers have to maintain their gaps, as well, until they’re certain it’s not a run, and that can often times take them 10–20 yards away from where they’d normally defend without play action. Atlanta’s bread-and-butter play to take advantage of this is a “hi-lo crosser” coming from the side of the run fake, back across to the boot side. One crossing route fits in behind the linebackers, while another comes from the tight end working behind the line of scrimmage. They sell this fake even further by routinely having the tight end come across the line of scrimmage on split-outside zone runs to block the backside linebacker, making the pass look no different from any other run. 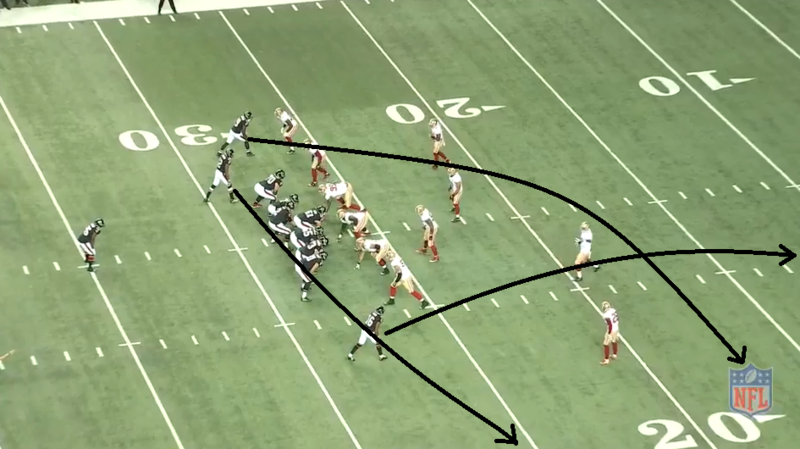 This is a play that Shanahan will dial up almost every week, and sometimes on multiple occasions. It’s also one of the most widely-used play-action run concepts in the NFL today. The read is simple for the quarterback, and every single receiver in the NFL can get open on it by running in a straight line—a great combination for an offense. 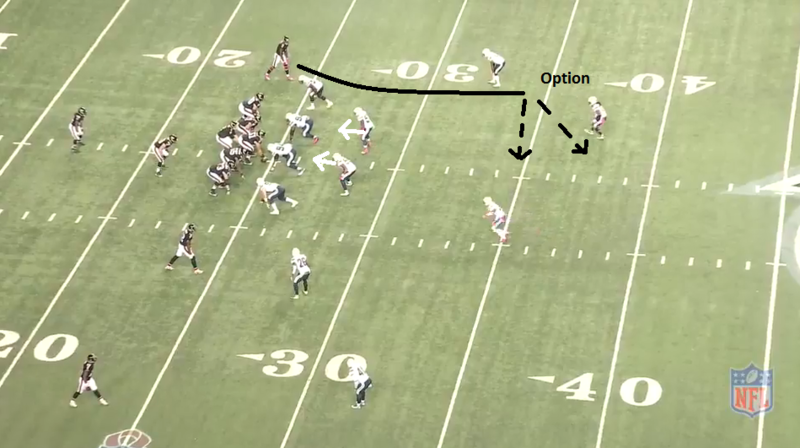 What’s not as prevalent around the league however, and what makes the Falcons’ attack so special, is the other concepts they have that play off of the crosser. The vast majority of the time when a quarterback rolls out of the pocket one way, all the routes on that play will track over to that side of the field, creating vertical stretches. This is so often the case that you’ll frequently see linebackers who bite on fakes sprint back towards the boot side of the field without even looking for a receiver, knowing a crosser is likely coming in behind them. That’s not always the case with the Atlanta offense, though. Even off of boot-action, the Falcons are still able to stretch the entire width of the field with their routes and force more busted coverages than any other team this season. One of their favorite ways to do this is with wheel routes, and no route has the capability to make defenses look stupider than the drag wheel. It’s an ingenious concept, as the tight end sneakily skirts into the peripheral vision of where safeties and linebackers are normally looking for routes to come from off of play-action fakes. It was run only a handful of times this season, but each time it led to big plays and left opposing defenses pointing fingers at one another. Scheme can only take you so far in the NFL, however, and sometimes your players have to be better than the opponents. If your player is Julio Jones, there’s a good chance that’s true. Give Jones and his 4.39 speed that much time to run a route, and no one in the NFL can cover him one-on-one. That’s why the Falcons’ No. 1 receiver recorded 570 of his 1,409 yards (40.5 percent) on play-action passes. Jones’ impact doesn’t stop there, though, as Ryan still went for 1,102 yards off play action to targets not named Julio Jones. The former first rounder’s greatest attribute might be how he influences the decision-making of safeties and corners solely because of the name on the back of his jersey. Getting defenses to focus their attention on one player inherently leaves them resource-deficient elsewhere. There’s another other large part of Atlanta’s play-action game that has yet to be mentioned, and doesn’t rely on bootlegs. 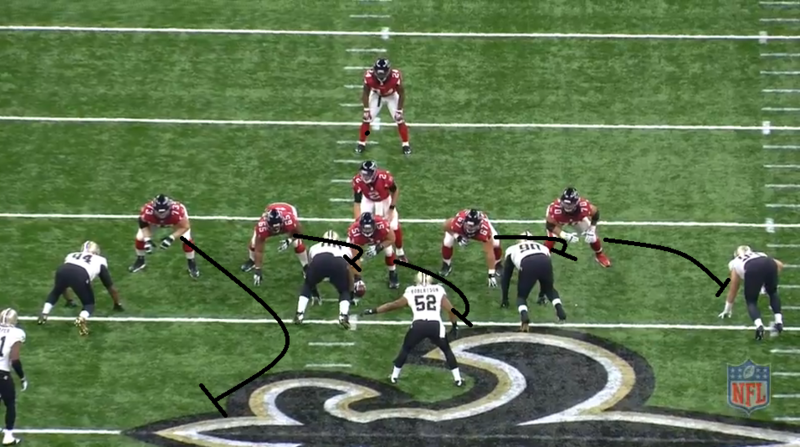 While boot-action is the Falcons’ go-to, Atlanta also extensively uses play action off of downhill runs that keep Ryan in the pocket. These tend to be much quicker-hitting, with most timing passes being released within 3 seconds of the snap. 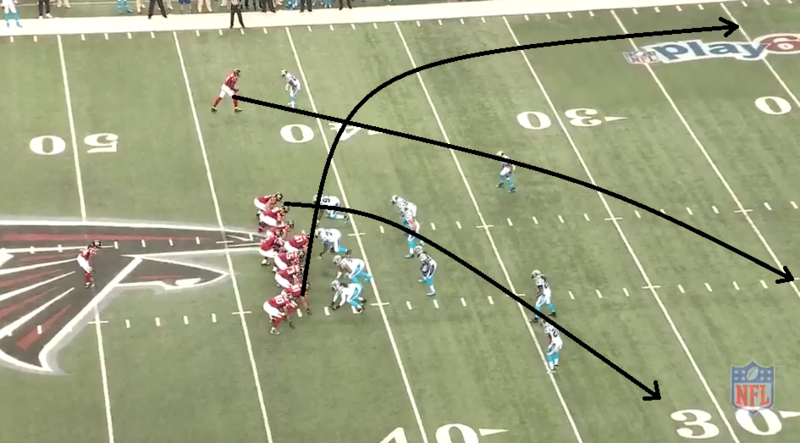 The bang-8 post and dig are the Falcons’ answer for man coverage to some degree. Whether to turn it into a post or flatten it to a dig is often an option for the receiver, depending on the coverage. The goal for both is simple: immediately exploit the area behind the linebackers after they bite on the fake. It’s crucial to time up the release of the throw with the break of the receiver to get optimal separation from the corner. This is Ryan’s signature route, as he throws it as accurately and as in rhythm as any quarterback in the NFL. He threw these two such routes 21 times this season, going 15-of-21 for 348 yards (16.6 yards per attempt) for a quarterback rating of 141.0. 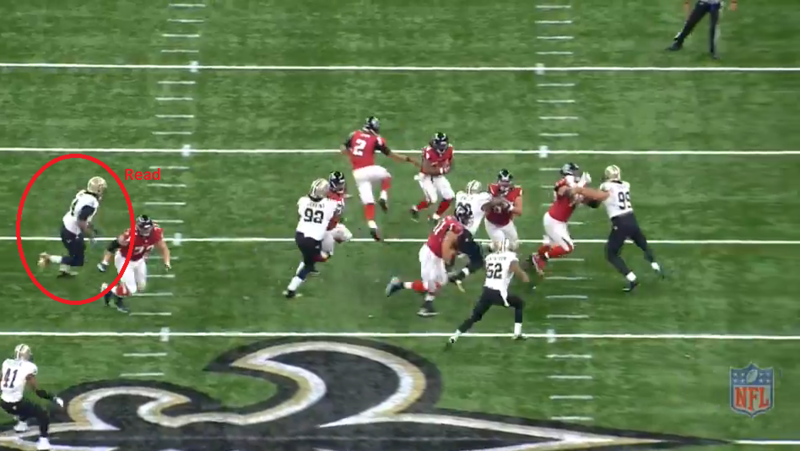 This is the Falcons’ play-action attack. The most prolific and proficient in the NFL this year. It’s also one that’s so diverse that game planning against it is a tall task. This Sunday, they face the king of game planning, Patriots head coach Bill Belichick, and he’ll certainly have something in store.